In the infancy of this millennium two things are certain: children injure themselves on the latest “craze” and children will (probably) read the Harry Potter books. Previous reports have highlighted the impact of emerging crazes such as inline skating and microscooters, with attention being drawn to potential accident prevention and emerging patterns of injury. One modern craze is the Harry Potter series of books and films. In the United Kingdom sales ofthe latest Harry Potter book, The Half-Blood Prince, are estimated to reach fourmillion, with around three million volumes being sold in the first week. 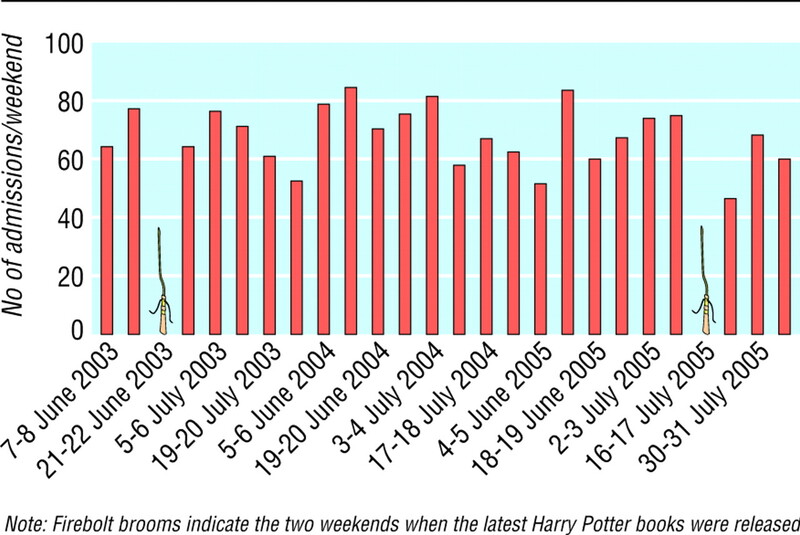 Given the lack of horizontal velocity, height, wheels, or sharp edges associated with this particular craze we were interested to investigate the impact the Harry Potter books had on children's traumatic injuries during the peak of their use. We undertook a retrospective review of all children aged 7-15 who attended our emergency department with musculoskeletal injuries over the summer months of a three year period. Weekend admissions were counted as those occurring between 8 am on Saturday and 8 am on Monday. The age range was based on that of reading competence on the advice of an educationalist. The launch dates of the two most recent Harry Potter books—The Order of the Phoenix1 and The Half-Blood Prince2—were Saturday 21 June 2003 and Saturday 16 July 2005. We compared the numbers of admissions for these weekends with those for surrounding summer weekends and those dates in previous years. We obtained data from the MetOffice3 (http://www.metoffice.gov.uk/) toestablish weather conditions recorded for each of the identified weekends at the closest weather station (Brize Norton) to our hospital. This allowed us to adjust for weather as a confounding variable if necessary. Harry Potter books seem to protect children from traumatic injuries. Fashionable or “craze” activities have previously undoubtedly contributed to the two million children who attend emergency departments with traumatic injuries each year. Organisations such as the Child Accident Prevention trust (http://www.capt.org.uk/) and Royal Society for the Prevention of Accidents (http://www.rospa.org.uk/) have yet to recognise the potential benefit of this new pursuit. To date no research has addressed the option of “distraction therapy” to prevent traumatic injuries. Alternative strategies such as “restraint therapy” and “pharmacological modification'” have been considered and abandoned on ethical grounds. Distraction therapy has been used successfully in settings such as painful clinical procedures with good effect. Potential problems with this project would include an unpredictable increase in childhood obesity, rickets, and loss of cardiovascular fitness. Contributors KW conjured up the original idea for the work having experienced a quiet on-call weekend, then witnessing three of his children “petrified” on the sofa. DPJH and ND are wizards with numbers. SG wrote the paper and performed a spell check. DPJH is guarantor. Competing interests KW has five children and has spent many summer days in the emergency department. SG, DPJH, andND have no children but each have a pet owl.
. Harry Potter and the order of the phoenix. London: Bloomsbury, 2003.
. Harry Potter and the half-blood prince. London: Bloomsbury, 2005.
. http://www.met-office.gov.uk/ (acccessed 4 Sep 2005).